Today Docomo also announced a new pricing plan for Xi LTE service that will be introduced with the upcoming tablets. 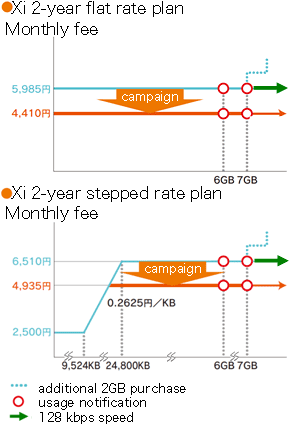 7 GB will be available for ¥4,410 in a flat-rate plan if signing up during the campaign period (until 4/30/2012) for a 2-year contract. After exceeding 7 GB, it appears that you have a choice to either 1) live with 128 kbps data for the rest of the month, or 2) pay ¥2,625 per additional 2 GB. In actuality, there will be very little change. 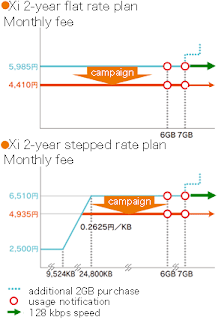 The flat-rate plan will save a total of ¥525, over the stepped plan for 7 GB. The stepped plan is just stupid. Why Japanese carriers continue to structure stepped plans based on decade old data usage habits is beyond befuddling. The minimum fee of the stepped plan will be raised from ¥1,000 to ¥2,500 which will include EXACTLY 9,524 KB. After which the the price will by ¥0.2625/KB until EXACTLY 24,800 KB are used. Then ¥4,935 will carry you to 7 GB. Xi is theoretically capable of 75 Mbps. Of course we'd never get this in the real world, but since the carriers like to throw around their theoretical yet unattainable maximum throughput, let's use their numbers. 75 Mbps is 9.4 MegaBytes per second. Rounding to the same number of decimal places, the initial cost of ¥2,500 buys exactly 9.3 MB of data. So this means that the stepped plan is structured to give you exactly ONE SECOND of full-throttle usage before the price starts going up, theoretically. Realistically, you'd probably only get a quarter of that speed, so let's be generous and give 'em 4 seconds. The full price for 7 GB is reached after consuming only 24 MB, easily done in a day with normal FOMA usage, or about THREE theoretical seconds with LTE (12 seconds, realistically). Unless you expect to not use your handset for an entire billing cycle, there is absolutely no reason whatsoever to even consider getting the stepped plan. I theoretically might have a month every year when I do not use data at all as I am out of the country. Normally this would not fall exactly to a calendar month though. But even if it did the stepped plan does not make any sense as you would need two months of no data to get cheaper yearly price. What are they thinking when they make these plans? Or are they? I thought I might save money by switching to the foma stepped plan for the month I was away, got back a day and a bit before the end of the billing period and still somehow managed to use the data up to the limit. I hadn't realised just how stupidly low the stepped plan was, won't waste time doing that again. It's not just Docomo. They all do it that way. This is why when I was first testing the fair, I shut it off for a little while. I was waiting for the start of the month and a new billing cycle. Then I went cold turkey on Docomo data. I figured that If I was going to be carrying around two phones, I might as well save some money while I was at it. But who would ever want to use more than 24 Megabyte of Data? That's crazy! After all, I could hardly store so much information here on my AT286, since my harddisk stores only 40 Megabyte! Stepped plan is good, my wife use use around 2000yen, she nned only mail for work but want a big screen. Really? That is hardly using it at all. For 2000 yen, you get 250 MB per month. Right now you are paying that for 24 MB! That's 10 times more expensive. And her usage is probably right on the verge of rolling over to full price. Depending on how much of a subsidy you received on the tablet, it might be cheaper to cancel and pay back the subsidy plus the 10,000 yen cancellation fee. The down side is that you won't get LTE speed but at 2 MB per month, you don't need it. It's not a tablet it's a phone (Galaxy N), she use also voice, Xi is not available here and dshe o not need fast connection, she only choose less expensive plan for her.